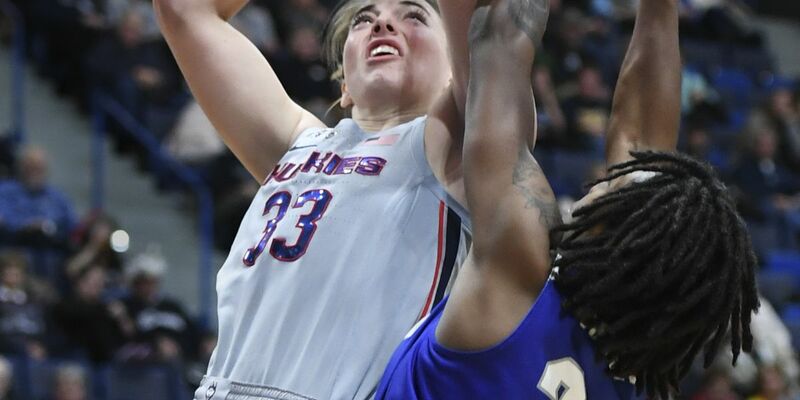 HARTFORD, Conn. (AP) — UConn's Katie Lou Samuelson says she's been working on becoming a more complete player, which really means improving her rebounding. The 6-foot-3 senior pulled down 16 boards Saturday to go with her 26 points and led UConn to an easy 99-61 win over former Big East rival Seton Hall. It was just the second career double-double for the All-American, who also had six assists. "Over the past few years we've had some of the best rebounders in the country, so we didn't necessarily need that from me," she said. "This year, we do and I've been trying to add that to my game more and more." Samuelson has always been a 3-point threat. She was just 4 of 12 from distance against Seton Hall. But her third 3-pointer, a shot from the top of the key in the fourth quarter, moved her past Diana Taurasi and into second place on the school's all-time list. Her 320 career baskets from behind the arc put her within reach of Kaleena Mosqueda-Lewis' school record of 398. "I don't know how many Lou's going to end up with, but she's pretty confident taking them, that's for sure," said coach Geno Auriemma. "She doesn't shy away from them. She's as good as we've had." Napheesa Collier added 18 points and Crystal Dangerfield scored 16 for Connecticut (9-0). Freshmen Christyn Williams (15 points) and Olivia Nelson-Ododa (13) also reached double figures. Nicole Jimenez played all 40 minutes and scored 23 points for Seton Hall (7-2), which had won three straight after its only other loss this season, at UCLA. "Everyone follow's Nicole's lead," said coach Anthony Bozzella. "Nicole doesn't quit. She plays hard. She plays aggressive. She plays tough. She plays fearlessly. Those are some of the standards that we're actually asking all our players to hold themselves to." The Pirates led 3-2 after a 3-pointer by Kaity Healy. But Samuelson hit three buckets, including a pair of 3-pointers, during a 10-0 UConn run that put the Huskies up for good. Williams had 15 points in the first quarter and UConn lead 35-13 after 10 minutes and 61-29 at the half. Seton Hall: The Pirates came in averaging almost 87 points. They shot just 36 percent from the floor, were 9 of 33 on 3-pointers, turned the ball over 17 times and committed 24 fouls. UConn: UConn has now won 124 straight regular-season games, 56 of those coming out of conference, dating back to an overtime loss to Stanford in the second game of the 2014-15 season. The Huskies have also won 82 consecutive home games. UConn forward Megan Walker sat out her second straight game with strep throat. Forward Batouly Camara remains out with a sprained knee, and sophomore reserve Lexi Gordon announced this week that she's transferring from the program. As a result, the Huskies dressed just eight players. Auriemma said that, at times, can be an advantage. "Guys get to stay in the game and they like that," Auriemma said. "It's good as long as we don't get into foul trouble and we don't do things that would require us to (be) taxed. It puts a lot of pressure on our guys to be really good defensively and be in really good shape." Kyla Irwin started in Walker's place for the second consecutive game and had six points in 29 minutes, hitting both of her 3-point attempts. Auriemma said he's excited to get production from the junior, who could be a key contributor. "It's nice to know my teammates have trust and confidence in me," she said. "I've been doing it every day in practice, so I think that helps." Seton Hall: The Pirates head home to face Georgia Tech on Dec. 20. UConn: The Huskies come out of their exam break on Dec. 19 at Oklahoma, then travel to No. 13 California and No. 4 Baylor.